The choice of kitchen cupboard handles and knobs is vast and the choice of finishes is amazing. Handles come in all shapes and sizes and can be tube shaped, square, flat, curved, D-shaped, wavy, pointed and textured – the list is endless. Curves, radii, indentations, holes, perforations and anchorage points for other materials can all be included in the handle design. Knobs may be round, square, tubular, oval, semi-circular, teardrop, flower shaped or abstract. Metal handles are always a practical choice – at home, in the office, in the workshop, or even in a hospital. The very wide range of designs means there is a handle for every piece of furniture and every taste. Modern, retro and traditional styles can all be found in finishes ranging from acrylic, steel, aluminium, wood, granite, marble and porcelain, to the more popular favourites such as brass and chrome. Handles made of die-cast zinc allow huge scope for individual shapes. Made of die-cast zinc, retro handles can be produced in a large range of differenct designs. Galvanic surfaces can be nickel or chrome-plated, with either a gloss or matt finish, while gold or brass-plated finishes give an optical impression of a solid gold or brass handle. The surface is coated with a clear lacquer for protection. Knobs and handles can also be powder-coated in any colour or given a sleek and modern aluminium finish – the scope for special effects and attractive combinations is huge. The combination of different galvanic surfaces and expert processing creates the desired retro finish that mimics the long-term ageing process. This work is still done partly by hand, so that each handle is in a way unique. Handles and knobs with rustic finishes are very popular as decorative highlights in country-style kitchens. They can also be used to accent the distinctive style of traditional furniture. Aluminium handles are machined from press-moulded profiles. Multi-part handles are screwed or pressed together, with adhesives seldom used. The soft surface of the raw metal handle is anodized to provide a surface hardness that can withstand daily use. Anodizing gives the handle its brilliant surface finish, available in a choice of colours and shades. The surface is resistant to permanent marking by most cleaning agents. Glass is manufactured by a smelting process and then processed. A huge range of colours can be obtained by adding pigments during smelting. The handles are then either moulded or cut from stock. 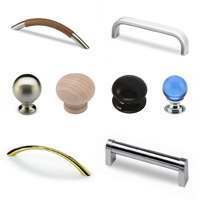 Glass handles and knobs lend themselves for use with both ultra-modern and romantic furniture in kitchens and bathrooms. Granite and marble is sawn, milled and drilled using diamond-edged tools and water. After the shaping process, blanks are ground using quartz sand and water. The finely polished surface of granite is treated with oil for high resistance against traces of daily use and environmental effects. Oiling also makes the surface smoother and more pleasant to touch. Granite is available in black, grey, beige, blue and red. Marble comes in two main surface finishes, silk and polished. A silky finish is obtained by grinding with quartz sand and water. Polished marble is obtained by five manual grinding stages followed by sealing with hard wax. The most frequently used marbles are white, grey, beige, red, green and black. With an evocative lifestyle image, marble handles and knobs are increasingly in demand for luxury kitchens and bathrooms. Marble handles are also extremely popular in public spaces and for reception desks in offices and hotels.